A couple of days ago a package arrived in my mailbox that made it most difficult to go to work that day. I didn't end up calling in sick (I do have a modicum of will power) but it was touch and go there for a few minutes. A few deep breaths and reminding myself I could snuggle up with it later got me out the door. You see, I've been wanting to get my greedy hands on this particular book in the worst way for lo these many months and then suddenly--there it was all blue and fiery and taunting me with its irresistible Goblin Market charm. The Demon's Lexicon roared onto my Best of 2009 list at the end of last year, fairly blowing me away with its wicked strong characters, dagger-sharp dialogue, and so much heart it set my blood to pumping three times its normal speed. I could immediately tell that Sarah Rees Brennan was something special and I knew it in such a way that I didn't waste a single moment hoping the next one would be as good. I knew it would be. Alan and Nick were going to be there, weren't they? It would be written by the same witty Irishwoman, wouldn't it? Right, then. Bring on the sequel. By the by, I had to post both the U.S. and UK covers of The Demon's Covenant here because I love them both so. Given that it's sort of Mae's book, she really deserves to be on the cover. Plus, that pink hair is just excellent. At the same time, I love seeing the demon's circle on the U.S. cover and as Sin and the Goblin Market play a larger role in this one it's quite fitting, too. It's been just about a month since Mae and her brother Jamie returned home to Exeter, shook the last lingering remnants of magic from their palms, and went back to life as it was before the brothers Ryves made their entrance and changed the rules of the world. Going to parties with her friends and flirting with the possibility of a relationship with a boy named Seb, Mae's working pretty hard to avoid thinking about the knife hidden ominously in her dresser drawer and the dangerous memories it represents. But when she stumbles across some magicians threatening her and hers once more, Mae does the only thing she can think of. She calls Alan. And, in true Alan fashion, he drops everything and comes to their aid, bringing his brother Nick with him. And now it's no longer a question of whether or not Mae can block out the past, but whether or not she can handle the present. When Alan and Nick are in town, things have a tendency to get muddled, and Mae finds herself alternately attracted to and frightened by Alan's unassumingly kind presence, Nick's overwhelmingly brooding one, and the murderously complex relationship developing between the three of them. And then there's the matter of Jamie and his propensity for attracting trouble of the most appalling kind and in the most alarming quantities. You would think that with Alan's brains, Nick's sword, and Mae's nerve they would be able to keep one scrawny, slightly emotional lad safe without tearing the whole of England apart. But when the Obsidian Circle is involved, all bets are off. And if Mae doesn't put the pieces of the puzzle together in time, she might not have a future to worry over. Mae grabbed Nick's arm and he whirled on her, then caught himself and stood looking down at her with his pulse thudding against her palm and the knife still in his hand. She lifted her chin. "Oh, put that away." Nick put it away. "Just making a point." "Yes, I took your point," Jamie muttered. "Right up against my throat." Mae looked away from Nick and walked quickly toward the wall, scrambling over it and trying so hard to make the climb look easy that she skinned her elbow as she did so. She pretended it didn't sting. Nick did not try to help Alan over the wall this time around. He stood with his hands clenched into fists in his pockets as they all waited for Alan to get over on his own. "I wasn't trying to hurt you," he told Jamie suddenly. Mae reached out and touched Nick's shoulder. Her hand brushed muscle, braced and tense under her palm, for a moment. Then he shied away from her and glared. She smiled as if this reaction was perfectly normal. "Sometimes when you pull knives on people, they get this impression that you're going to hurt them, and then they're completely terrified. Crazy, I know!" "Okay," said Nick. He turned to Jamie and popped his left wrist sheath again. "Look." Jamie backed up. "Which part of 'completely terrified' did you translate as 'show us your knives, Nick'? Don't show me your knives, Nick. I have no interest in your knives." Nick rolled his eyes. "This is a quillon dagger. That's a knife with a sword handle. I like it because it has a good grip for stabbing." "Why do you say these things?" Jamie inquired piteously. "Is it to make me sad?" "I didn't have you cornered," Nick went on. "You could've run. And this dagger doesn't have an even weight distribution; it's absolute rubbish for throwing. If I had any intention of hurting you, I'd have used a knife I could throw." Jamie blinked. "I will remember those words always. I may try to forget them, but I sense that I won't be able to." Man, I love Jamie. And I love the flashbacks we get in this tale. The past is a living and breathing entity here and it is with marked trepidation that our protagonists endeavor to parse out its meaning in the present day. And for those of you interested, Ms. Brennan makes good on her promise that this is the Make Out book. There is no disappointment in that regard. Though you may find yourself even more torn when it comes down to it. But that's the beauty of the story. It continually withstands pigeonholing and rises above expectations. 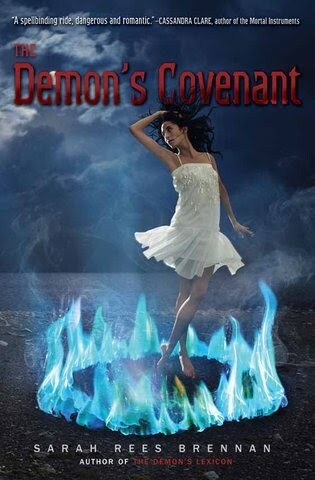 The Demon's Covenant is an unbelievably satisfying and exciting second novel. It surprised me at every turn and it raised the stakes impossibly high. I gasped more times than I can count and my heart went out to each character repeatedly. And if it went out to Alan and Nick a little bit more, well that's my affair. I love them and I love this book. Not the least because it is above all about families, the bonds we form, and the sometimes feeble, sometimes illuminating ways in which we love--beyond reason, beyond blood, beyond even the bands of this world. Finest kind. 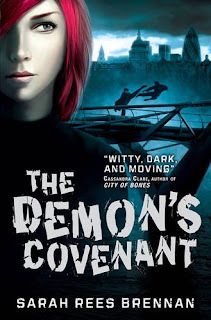 The Demon's Covenant is due out May 18th. I've gotta say, I really like the UK cover. This sounds like a great series. I adored Demon's Lexicon! Can't wait to get my hands on this book. I'll come back and read your review more when I've read it. I started The Demon's Lexicon a while ago and put it down after 65 pages. I've now read your review of the sequel and have pulled Lexicon off the TBR pile again. Such a great review! I want to know what I'm missing! Fabulous review Angie, especially the last line. I completely agree. I can not wait to revisit this world and these characters. Thanks for posting the dialogue, I adore Jamie! He's So funny. I got goosebumps reading your review, is that normal? And I am fully expecting this book to be better than The Demon's Lexicon, and I am going to get torn apart by this story-telling, I know I am. What's really annoying is that the book comes out on my first day of exams... This is Not Good for productivity. Jen, believe me I am fully cognizant of how fortunate I was to get an early copy. Glad you've got it all pre-ordered! Only a few days away now. Which copy did you order? Katy, I know. I <3 the UK covers for this series so much. I read my US copy of the first book and immediately ordered a UK version because I loved it so much. Planning on doing the same with this one. And it's a superb series. Definitely give it a shot! Karen, oh, I hope it clicks for you this time. I just did the same thing with THE POISON THRONE. Put it down after about that many pages and went back to it last night. SO good! I'm completely sucked in. So it was clearly me and not the book. It happens. Let me know if you do finish it. I adore these four kids. And I'm very sorry about that timing for you. That's rough. Oh Angie you wicked, wicked girl. That quote and your amazingly favorable review is going to wreck havoc with my nerves until I can get my hands on a copy. But I am so, so, so, SO very glad you liked it. I'm dying for a little more Nick and Alan time myself. Ahhhh can't wait to get my hands on a copy of this! I'm so glad you loved it because it means it's going to be great. I hope we get the UK edition over here because I love that cover. Can't wait to read this! I love the scenes with Jamie and Nick. And, the brothers' relationship is so well done. I love how your enthusiasm for this series and these characters really shine through in your review. I'm looking forward to reading this one too. The first book ended with such a fascinating surprise... I'm dying to know more! Michelle, *ducks* I know! I know. I am very wicked indeed. You will love this one, though. *love* it. Alan & Nick FTW! Chachic, it's a great cover. I hope you get it soon, too, so we can dish about it! Jen, well said! I completely agree. Just the words on the page, baby. Christine, hehe. It's hard to hide with this trilogy. They are so very fine. Thanks so much for your review. I can't wait to read this one. I've been waiting for your review of The Poison Throne and feared it was one of the books causing your reading slump. I'm glad you've tried it again and have been sucked in by it. I bought it when it was first released because I think it's right up my alley, but I haven't cracked it open yet. I'd like to read it before the second book comes out. Karen, POISON THRONE review is on its way. I'm . . . conflicted. And I love your list of books to read. SO happy you're loving MAGIC BLEEDS. I *need* that book. Oh wow! It sounds amazing! The first book was on my "best of 2009" list, too, so you know how much I'm looking forward to reading this! I was a bit disappointed at first when I heard it was going to be more from Mae's point of view, but after your review, I'm expecting to enjoy it. Now, if the mailman can hurry I'll be happy!